During the 12-month period from November 2017 to October 2018, the average total number of employers in Iceland was 18,230 and the average number of employees was 193,600. This is an increase of 602 (3.4%) employers and 6,200 (3.3%) employees compared with the period from November 2016 to October 2017. In October 2018, there were about 133,800 employees in the business sectors which is an increase of 1,700 (1.3%) as compared with October 2017. During this 12-month period, the total number of employees increased by 3,600 (1.9%). These figures are preliminary. When using income data as the source, there is a risk of underestimating the latest figures if employers do not submit information in a timely manner. Other causes of error include reimbursements to former employees. When new data are published, previous figures are revised. For more information on revisions and their magnitude of recent revisions, please refer to the metadata and the summary of revisions. Previously published statistics on employers and employees have been revised to take into account the latest available information on salaries and classifications of employers based on their main economic activities. The number of employers in September 2018 is now estimated at 18,488 and the total number of employees is estimated at 195,800. The number of employees increased by 4,300 (2.3%) from September 2017 to September 2018. In November, the number of employers and employees in September 2018 was estimated at 18,318 and 191,500, respectively. 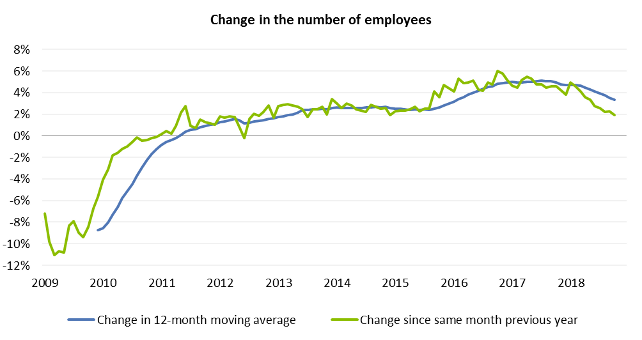 The number of employees was then estimated to have increased by 3,900 (2.1%) from September 2017 to September 2018. Statistics Iceland publishes annual income and balance statements of enterprises by activity, based on tax returns to provide a detailed picture of the individual sectors for the period 2002-2017. Statistics Iceland conducts a continuous labour force survey (LFS). The main results (e.g. unemployment) are published monthly and more detailed results (number of full-time employees, working hours by industry, etc.) are published annually. The labour force survey provides information on both employees and self-employed people and only people who are permanently living in Iceland are included in the sample. Hence, the LFS figures are not the same as published in this press release. Data on the number of employers and employees should be used mainly as short-term indicators and to provide information on within-year variations. It should be noted that these figures do not include information on self-employed people with calculated remuneration, a common situation in construction, agriculture and creative industries. Statistics Iceland has started publishing register-based data on people in employment, including those who are on maternity leave or self-employed. That publication encompasses the number of employees by gender, age, origin and legal residence. Those figures are updated monthly on Statistics Iceland’s website.